This archive holds all posts form October 2012. October 8, 2012 • Jessie Daniels • "manifest destiny"
There is a strong, radical history among Italian Americans that has been largely forgotten. In their book, The Lost World of Italian American Radicalism (Praeger 2003), Philip Cannistraro and Gerald Meyer, help uncover some of this history. Their edited volume shows that in contrast to their present conservative image (cf. Carl Paladino’s recent anti-gay remarks), Italian Americans played a central role in the working-class struggle of the early twentieth century. Italian Americans were leaders in major strikes across the country—notably the Lawrence textile strikes of 1912 and 1919, the Paterson silk strike of 1913, the Mesabi Iron Range strikes of 1907 and 1916, and the New York City Harbor strikes of 1907 and 1919, as well as coal mining strikes. They also made important contributions to American labor unions, especially the revolutionary Industrial Workers of the World, the International Ladies’ Garment Workers’ Union, and the Amalgamated Clothing Workers of America. At the same time, they built vibrant radical Italian immigrant communities that replicated the traditions, cultures, and politics of the old country. For example, Italian immigrants formed their own political and social clubs, mutual aid societies, alternative libraries and press, as well as their own orchestras and theaters, designed to promote and sustain a radical subculture. This radical subculture was oppositional to both the hegemonic culture sustained by prominenti (the powerful men of the Little Italies) and the individualistic culture of capitalist America. Yet, for the most part, this radical tradition has been set aside in favor of the hagiography of Columbus. 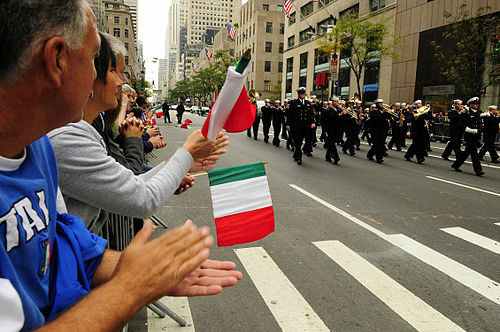 This holiday, I’m saying “nevermind” to Columbus and cheering the radical history of Italian Americans.